North Korea says it now has the power to mount a nuclear warhead on ballistic missiles that could be aimed at its enemies after conducting its biggest nuclear test yet, an explosion compared to the Hiroshima blast. The test, the country's fifth, was condemned by South Korea as "maniacal recklessness" and prompted the US to warn of "serious consequences." 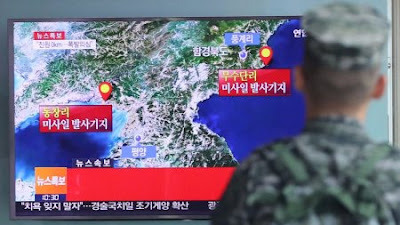 "Scientists from the DPRK was said to have carried out a nuclear explosion test for the judgment of the power of a nuclear warhead newly studied and manufactured by them at the northern nuclear test ground," a TV announcer said, using the North's official name. The test will also enable the North to produce "as many as it wants (of) a variety of smaller, lighter and diversified nuclear warheads of higher strike power", she said.